In response to my April 1, post China Margin Debt Soars to Record 1 Trillion Yuan; Another Central Bank Sponsored Bubble I received an email from reader Nicolas. Happy Monday. I find your output excellent an I hope that you are flattered that you are followed by private banks is Switzerland. Quick question on your last note; please can you tell me what (Bloomberg/Reuters) code you use for Chinese Margin debt? i.e. where can I cross-reference the Trillion Yuan figure you quote? I certainly was unaware I was followed by banks in Switzerland. Thanks! The Bloomberg data is from SSE Margin, in Chinese. I asked my friend Chris Puplava at Financial Sense if he was aware of a Bloomberg tracking symbol. We do not believe there is such a symbol for margin. 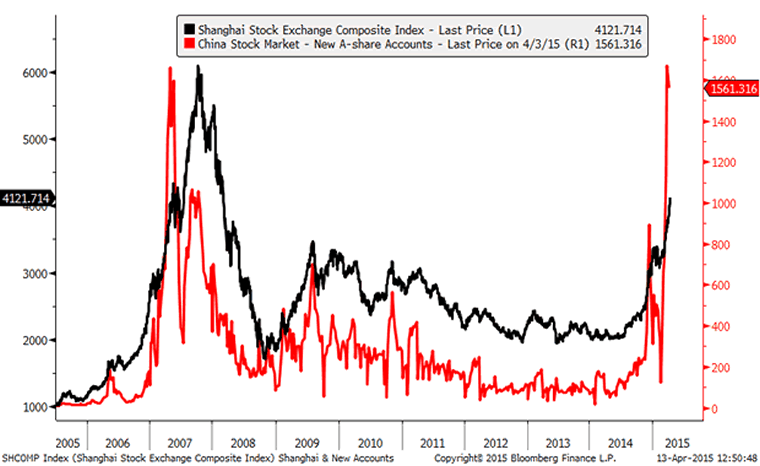 However, Chris did locate this interesting chart of the Shanghai stock market vs. new accounts that is available on Bloomberg. Thanks for your "straight talk" on important issues impacting our financial lives. You recently sent information concerning China's GDP. A good indicator of growth is found in sales of construction equipment. Construction equipment manufacturer Komatsu lists its equipment orders by location. The numbers speak for themselves concerning growth and China. Keep up the good work! Komatsu is just a single manufacturer. It may not be representative of all such activity and orders. But given the collapse in commodity prices such as iron ore I suspect it is. If so, this segment of the Chinese economy looks like a disaster. Those expecting a rebound in Chinese housing or construction are likely mistaken. The new game in town is clearly stock market speculation. My post Reality Check: How Fast is China Growing? Global Recession at Hand is also consistent with the China rapid slowdown thesis.